Santa Paula was built on the foundations of citrus cultivation and oil production. Ventura County's first irrigated 100-acre orange orchard was planted at Santa Paula in 1874, and the original 1888 harvest was so plentiful and delicious that the Limoneira Ranch Company was incorporated in 1893 and continues to thrive. Oil seeps brought wildcatters, and California's first gusher came in at Santa Paula in 1888. The town's twin notorieties through the 20th century were its designation as the "citrus capital of the world" and as the birthplace of the Union Oil Company of California (UNOCAL – now absorbed by Chevron). Lemons and avocados remain the primary tree crops, the oil fields still produce, and the small-town character of bygone days has been preserved—Santa Paula has the largest concentration of vintage structures in the county. Author Mary Alice Orcutt Henderson, the president of the Santa Paula Historical Society, is the great-granddaughter of an 1882 homesteader on land that the family continues to farm. 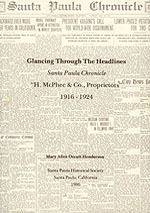 The granddaughter of William Warren Orcutt, the "dean of petroleum geology," Henderson has written several other publications on Santa Paula's history. The photographs illustrating this tour through the community's past, from 1870s to 1930, were drawn from the Archives of the Santa Paula Historical Society and private collections of family photos never before published. An Images of America publication, it is one in a series which celebrates the history of neighborhoods, towns, and cities across the country. Using archival photographs, each title presents the distinctive stories from the past that shape the character of the community today. Arcadia is proud to play a part in the preservation of local heritage, making history available to all. This book was the creative result of Henderson reading through original copies of a vintage hometown newspaper. She picked the years of Horace McPhee’s tenure as editor/publisher, 1916–1924, because of the flavor he lent to his publication. These were the years of the World War, Influenza, Prohibition, Women’s Suffrage and other less eventful but important daily happenings in a small town. Subtle ironies and humor glimmer among Henderson’s choice of news stories and ads. Altogether, her tight focus on the life and times of Santa Paula through its press is an offbeat way to tell an honest, historical story. An excellent companion to her newest publication. Your copy will be sent to you promptly. This visual history of the 20th century's middle decades in Santa Paula illustrates how a rural city settled into its middle age. 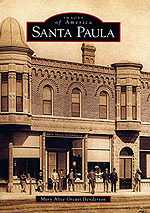 As a sequel to Images of America: Santa Paula, which covered the pioneering and settlement years of 1870 to 1930, it continues this Ventura County city's story through the Depression decade and the World War II and Korean War home front years that led up to the sixties. The time from 1930 to 1960 was prosperous for the two main industries in Santa Paula and its environs: citrus cultivation and oil production. The population increases reflected the job opportunities that these industries presented, bringing other families, businesses, and opportunities to the growing city. Author Mary Alice Orcutt Henderson has local family roots dating to 1872. Her family still owns and farms part of its initial 640-acre homestead. The founding president of the Santa Paula Historical Society, Henderson's link to the city's past, along with her ancestors' reminiscences of early times, have sparked her passion to share hometown history. 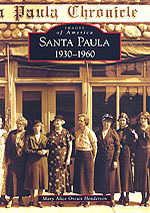 Most of the photographs came from generous local families, and the Santa Paula Chronicle was the primary research source.